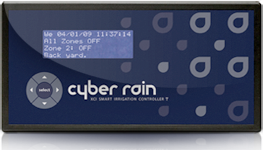 Cyber-Rain checks the weather and automatically adjusts your irrigation schedule. No more watering in the rain! Cyber-Rain users average a 35% reduction in water use, and, since Cyber-Rain uses the internet, weather updates are always free! No more confusing knobs or dials! Use pictures to set a water-site schedule customized to your landscape. Set watering days with a click of the mouse. Your Cyber-Rain can be accessed from any internet-connected computer. Perfect for the landscape professional and the person on-the-go. 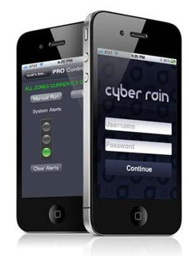 Download the Cyber-Rain App and then use your smartphone to remotely control your sprinklers. You can manually run valves, upload zone images, set holds, and check your system's status. Almost all Cyber-Rain XCI controllers are Cloud compatible. Simply connect a gateway access point to your router and wirelessly bind with your Cyber-Rain controller.